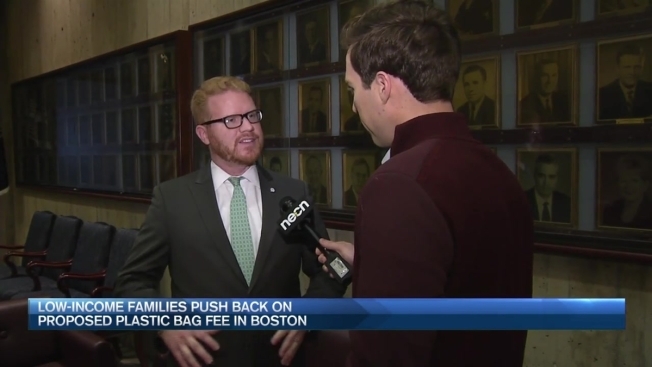 Opponents of a proposed bag fee in Boston are pushing back. "I just think it's a big imposition," Jim Farrow of the city's Mission Hill neighborhood said. The city council is debating a bill that would reduce the use of plastic bags in city limits by requiring stores to charge five cents at checkout for every bag used. "[Plastic bags] are everywhere," said Aileen Kelley, who lives in Boston. "I've actually had them hit me as I'm walking down the street." Tuesday afternoon, the bill was debated in a public hearing in the City Council chamber amongst environmental experts and residents. "There are much, much greater things we need to do right now," said Lawrence Wedgeworth, who lives in Roxbury. One major question being asked is whether the fee is fair for lower income families. "At this time, we do not support the proposed ordinance," said Commissioner Carl Spector of Boston's Environment Department. "Recognizing that some of our municipal neighbors and other cities across the country have adopted similar proposals, we remain concerned about their impact, especially on lower-income households and smaller stores." Erica Mattison, the legislative director of the Environmental League of Massachusetts, is in favor of the bill. "I think anytime you're going to have some change, you're going to have some opposition to it," she said. The bill is sponsored by Council President Michelle Wu and Councilman Matt O'Malley. "There's no doubt that even a penny or five cents is going to be impactful," said O'Malley. "I'm not doubting that. One thing this ordinance seeks to do is really encourage businesses to offer a five-cent rebate if someone brings a reusable bag. We cannot mandate that in the ordinance. We can encourage." Some groups like Mather Elementary School Girl Scouts have started collecting reusable bags in the city and handing them out for free. Mary Grady is one of their leaders and says they have handed out hundreds of bags. "We're distributing these reusable bags at the farmer's markets in Codman Square as well as Ashmont and the response has been wonderful," said Grady. As for why the city wants to do this, proponents cite concerns over pollution. "I'm so tired of picking up plastic bags that are dropped maybe half a block from the store from where the item was bought," said Rosemary Jones of Jamaica Plain. There is no deadline to get the bill approved. The next step is to get it out of committee, where the council could then vote on it. If they pass it, the bill would then go to Mayor Marty Walsh's desk.